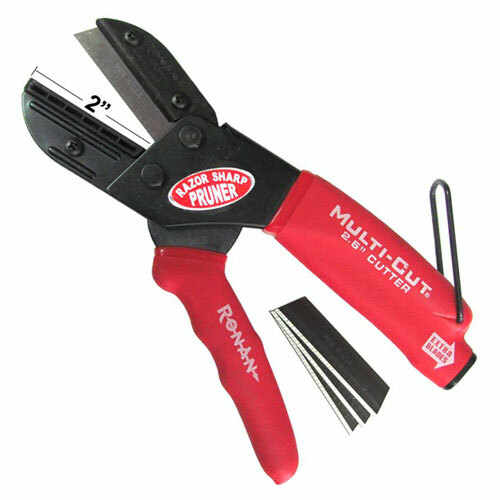 This top quality 2" Molding Cutter multi-cut tool is great for cutting most any material and prevents splintering and fraying of the items you're cutting. The unique offset pivot point design gives you extra leverage especially on this 2" style, making difficult items easy to cut and the safety lock feature ensures that you can store the tool safely. Use it for plastic, rubber, linoleum, paper & cardboard, rope, weather stripping, vinyl, wood trim, insulation upholstery, auto trim, door edge trim, body side molding, leather, pruning bushes & trees & much, much more. 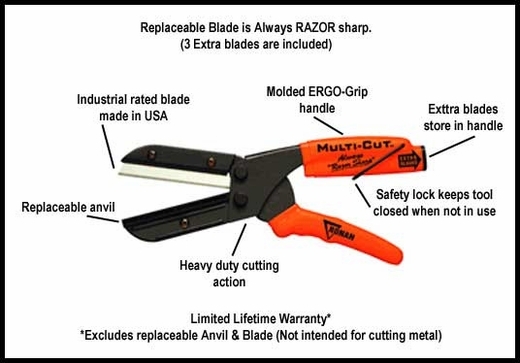 Under normal use, each razor sharp industrial strength steel blade will last an average of 18 months so you can rely on this Ronan Multi-Cut tool to be there for you for years to come. The Multi-Cut is NOT just another pair of scissors. When you use scissors, you are limited to cutting sheets of material, such as fabric, paper and thin plastics. The Ronan Molding Cutter tool features a razor sharp blade that presses down on a flat replaceable, high impact anvil that protects the blade from wear to give you incredible cutting ability for cutting dense, thick, rigid materials easily & neatly. 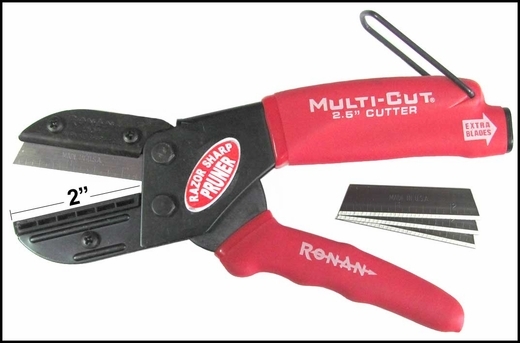 The patented Multi-Cut was originally designed for industrial use to cut thick vinyl trim with precision for the auto industry. Inch graduations are even etched into the blade itself to aid in notching or simple measuring. The Ronan Multi-Cut tool features a durable black oxide coating which resists rust and corrosion helping to make this the perfect tool for both the contractor and the "do it yourselfer". 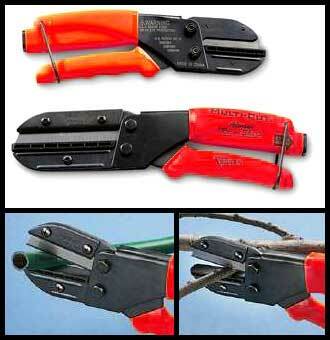 Molded ERGO-Grip Handle w/built-in blade storage & safety lock. Full 2" blade & anvil style blade cutting surface. I would not have been able to cut the new side molding for my car. This made it a piece of cake, honestly I wish cutting cake was this easy lol 5stars. Thank you!!!! Best,smoothest and easiest to use of any cutter ever. Great tool. Good true cuts. I always struggle with right tools, not this time, cutters were very nice. Made short order of cutting door edge guard & cpvc plumbing pipe. They not only do a Great Job trimming Door Molding, I use them as my go-to trimming/cutting tool- Don't know how I trimmed/Cut anything so cleanly before getting them.